It’s rare that I feel compelled to write a blog about a piece of software or service. However, in the case of Campaign Monitor they are worthy of significant praise for producing a cloud application that makes the lives of marketers significantly easier when it comes to delivering successful email marketing campaigns. The email marketing industry is actually surprisingly small, with a limited number of email service providers (ESPs) all vying for attention. If you compare their features, at a glance there isn’t a huge difference in terms of product differentiation; most of the big players supply the essentials required to run and measure an effective email marketing campaign. However, for me, what makes Campaign Monitor really stand out is, firstly its attention to detail when it comes to its highly user-centric SaaS (software as a service) interface, and secondly, a handful of features that add that extra pazazz (yes that’s the technical term). Comparing previous email campaigns is by no means exclusive to Campaign Monitor, but I’ve chosen this feature regardless. Email marketing is a process of continuous improvement; modelling, measuring and modifying email campaigns based on previous results can make all the difference in ‘outcomes’. Campaign Monitor makes it easy to compare multiple campaigns offering graphical and tabular data as well as a handy export function should you need it. The Worldview screen is certainly one of Campaign Monitor’s sexier tools. Once you have broadcast your emails, the Worldview screen presents a real-time global map with pins indicating where your emails were opened or clicked, as well as the email address of the subscriber. The Worldview is a simple snapshot of your global performance and visually very appealing. 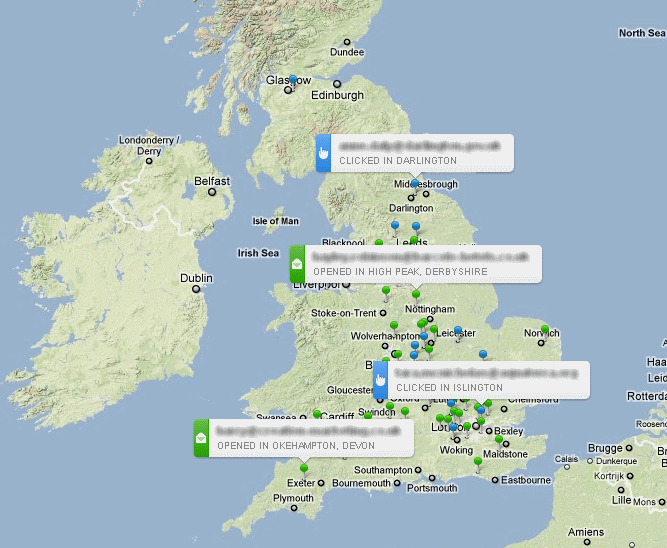 You also have the ability to zoom in on countries or regions. Nowadays, a truly integrated email campaign will often include a social marketing element to it. To fulfil this, Campaign Monitor offers two social media tools that answer this need. Firstly, you have the ability to embed Twitter and Facebook social sharing widgets within your emails. This is carried out with considerable ease within the WYSIWYG editor. Anyone receiving your email then has the ability to ‘like’ or ‘tweet’ it, with Campaign Monitor providing you with a social interaction report. Prior to this feature being available, I remember having to URL encode each social sharing link within the email, which was slow going and often prone to errors. My only criticism is that more social sharing services should be made available, particularly LinkedIn and Google+. Secondly, Campaign Monitor offers marketers the ability to share campaigns via Twitter or Facebook using a shortened URL . 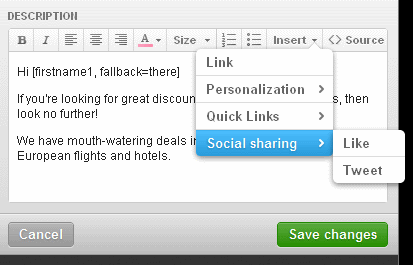 This is a handy feature allowing the use social channels to increase reach. And, as above, uptake can be measured within the social interaction report. Campaign Monitor was conceived in 2004 by Ben Richardson and David Greiner, whose web design background led them to develop a service that was ideally suited to web designers and agencies looking to run client campaigns. Nowadays over 100,000 companies (agencies and clients) use the service. If you’re a marketing or web design agency looking to broadcast on behalf of your clients, Campaign Monitor gives you a range of customisation options allowing you to maintain a branded experience. 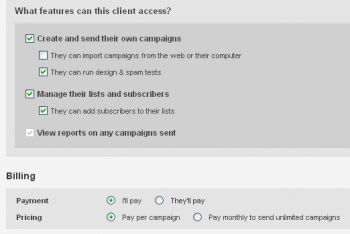 And, furthermore you can customise your clients’ permissions from the draconian viewing of campaign reports only, to the ability to upload, broadcast and pay for campaigns with less agency involvement. The beauty of a well designed interface is that the service works equally well for both agencies or clients, without interfering with the software’s user-centricity and ease of use. A classic case of form follows function. Continuous improvement should be at the heart of any email marketing campaign. A/B or split testing functionality is one way of achieving incremental improvements in outcomes be it open rates, click-through rates or other metrics. Whilst A/B testing is by no means exclusive to Campaign Monitor, its interface allows easy testing of subject lines, from addresses or variations in design. Once you’ve selected your testing criteria, Campaign Monitor will serve each version to a pre-defined number of test subscribers. A winning version will then automatically be selected based on your pre-defined criteria such as open rates, total unique clicks or total clicks on a selected link. The software will then wait for a period of hours or days (again defined by you), before sending the winning campaign to the rest of your subscribers. Just what marketers need from an industrial strength ESP. Well done Campaign Monitor and thank you! Interesting, but I don’t see anything other providers don’t also offer. What I want is a system that’s happy to take paste from Word – often it takes ages to sort out formatting and reformatting, and if you don’t strip via Notepad, it goes pear-shaped. Mailchimp is particularly bad: on the other hand, they offer the features I want and a great ‘test and comment’ for manager sign-off. Thoughts? Hi Zena, you’re right that there’s little to differentiate the functionality between email service providers. Mail Chimp’s earlier incarnation wasn’t my cup of tea, but it has improved a lot and now offers free email broadcasts if your list is less than 2000 strong. If you’re having issues with copy and paste, it’s definitely worth trying Campaign Monitor’s templates which make content editing a lot easier and also strip out unwanted formatting “notepad style”. I prefer MailChimp’s UI, but their authentication support is hideous. DKIM is not offered (it’s 2013 for crying out loud). Basically this stuff is MUCH better done in CM. Secondly, the “clients” feature is fantastic. Many services including MC do not offer this simple but super-useful capability.